It is interesting that all the theatres which are represented in the collection have 'royal' names. 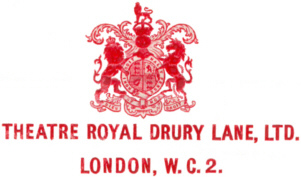 The Theatre Royal Drury Lane is the oldest English theatre still in use. It has its origins in a Royal Patent granted in 1660 by Charles II, with a theatre being erected soon after. The present building, designed by Benjamin Wyatt, was built in 1812. The initials FBC in the centre crest are for F B Chatterton who was involved with the theatre for at least 30 years. In 1849 and 1855 he is noted as the box office keeper; was the manager in 1875 and is stated to have been involved in the management from 1863 to 1879. 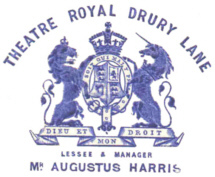 Augustus Harris who is named as the Lessee on another of the crests took over the theatre in 1879 and continued to be involved down to 1897. The Royal Lyceum, Edinburgh was built by C J Phipps in 1883 for Howard and Wyndham who were both actor-managers. They eventually ran a chain of theatres. The Royal Court Theatre, Sloane Square, was built in 1888 to the design of Walter Emden, apparently replacing an earlier theatre of the same name. It is now dedicated to producing new works by innovative writers world wide. The New Prince of Wales Theatre, Greenwich, is just one of the names borne by the theatre which was demolished in 1937 to make way for a new Town Hall. The name of the lessee, W Morton, relates it to Morton's Model Theatre. Other names were Carlton, Theatre Royal, and New Greenwich Theatre. The Theatre Royal Haymarket is the successor to The Little Theatre in the Hay which was opened in 1720. A century later, in 1821, it was replaced by a larger theatre built to a design by John Nash. Both theatre goers and actors were great clubbers. The crest on the left below is that of the Garrick Club which in its early days (it was founded in 1831) was stated to have had nearly all the leading actors as members. The location of the Yorick, which is represented by two striking crests, is not known. Possibly a literary club of that name in Melbourne, Australia, which had an influential membership in the 1860s and 1870s.